As Clare said in the message Saturday, Week One of the two weeks the Lord has called us to was FULL of offerings! We've all been given many things to give to the Lord for the sake of this country, with all the problems and evils that threaten to tear us apart at any moment. From the comments on her message, I have seen that you all are well acquainted to exactly what I am talking about, too! One of the things that Clare, Ezekiel and I have been offering is at least one period of intense prayer together a day, along with our prayer Team. Typically, all this past week, around 10:00 in the morning Ezekiel had been called into a state of suffering, often lasting upwards of an hour. By around Thursday of the week, he was seeing that we were praying over souls of people that were being tortured and executed, usually two or maybe three. But we weren't sure, yet, of just who or where they were. Saturday morning, before that day's message had been published, the Lord allowed us greater insight into that. We have somewhat fallen into a pattern over the past months, in times like this, this way. Clare will call to let me know the Lord is calling us to prayer, because Ezekiel is experiencing serious pain. Clare will take care of any physical comfort needs she can with Ezekiel, and then go and celebrate a Lord's Supper for the sake of whoever we are praying over. I will text the prayer Team to come join us, and then 'sit', so to speak, with Ezekiel, praying with him on the phone so that he doesn't feel alone. Saturday, the first thing Ezekiel said to me was, 'He is on His Cross again.' He knew that there were not just one now, or two being executed - but MANY. Clare was still in the room when he said that, and immediately added, 'It's at Gitmo. They are trying to get information out of people, using strong means to get them to talk.' They both asked me to alert those on the Team who were priests, to then go to these people in the spirit, and offer them absolution and last rites. Soon, Ezekiel began to understand that some of these people were not actually IN Gitmo, but on a Russian prison ship. And that many of them were from a Russian Orthodox background and would readily understand and receive absolution. Many of them had been baptized as infants, or children. But through their lives, they had been layered over with sins and self and pride and the world... until they were barely recognizable. It was these souls, in particular, that we would be praying over, and would understand. Ezekiel realized then, too, that our President is not the only one trying to 'drain a swamp'. President Putin is doing his own 'draining'. Interestingly, I was talking to a different member of our Intercessors later that afternoon, who is also a priest. She said she had been sent in the spirit, independent of knowing anything that Ezekiel was hearing and seeing, to several ships at the same time. And she was working with Holy Spirit to go to many, many souls, to give them absolution and last rites. Because this was all through the power of Holy Spirit, she knew that even though she only seemed to be speaking to one soul - Holy Spirit was magnifying, or multiplying, her words. And in this way, the absolutions were reaching many, many more at the same time. She was also allowed to feel His power go out when they were received and accepted through Him. The Lord told her that this was a gift to everyone who was involved; to have the opportunity to co-labor with Him. To help souls we'll never meet this side of the Veil. She said she would have never considered that we could not only intercede for them, 'at a distance', so to speak, through broad prayers like things like the Chaplets and rosaries. But to now be actively THERE in the spirit to co-partner with Him, to give absolution in 'real time'. As we continued to pray, both Ezekiel and I began to feel a deep, deep sorrow in our hearts. Ezekiel could now hear some of the souls that were dying. The Lord had appeared to them in the spirit, and was telling them, 'Come. I will forgive you. Just come. Receive Me.' They were realizing what they had done, the wickedness of their lives, their deeds. WHO they had been serving in it all and how evil it all was. How evil he, the Enemy, was. "And they were falling to their knees before the Lord in amazement," he began. "That He was willing to still show them Mercy. In deep sorrow and repentance, they were crying out, 'But Lord! How can You forgive ME?' But He was. Jesus was touching them all, receiving them, receiving their cries of repentance. "These were relatively big, strong men - and they were sobbing. On their knees, just weeping at His feet. The Justice of God was there, hovering over them. It seemed to have a mass of its own, encircling them. I heard some of them saying, 'Lord - I will accept ANY punishment from You for what I have done. Anything! I deserve it all!' They were saying, one after the other, 'But it's MY fault! I'm guilty! I deserve Hell for all of these things!!" "And the Lord simply picked up His hands, like He always does, and showed them the wounds. And that Circle of Justice backed right away from them. Daddy-God came in then, and they were all just regenerated, swept up in His arms. Holy. Pure. Changed back to what they were in the beginning of their lives, like pure, innocent babies. "Never before have I seen His mercy in that clear a light, that great a way. "His Mercy over them was in direct response to the Heartdwellers; their prayers. Their offerings. Their sacrifices for the sake of His Souls that were still lost and wandering; buried under sin and darkness. 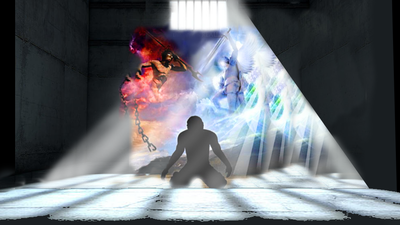 "When the prisoners were repenting, at first it was if the gates of Heaven had been shrouded somehow. They couldn't be seen through the 2nd Heaven atmosphere. But it was just the filth, the smog of all the sins of the Earth had risen and clouded my view. "But once Jesus showed them His hands, and Justice was pushed back away, it seemed as though all of Heaven was watching. And all of Heaven came down, spearheaded by His Mercy, right at the point, just like a spear. Our prayers, offerings, sufferings were ascending up through our atmosphere into the 2nd heavens, while His Mercy was coming down. They collided head-on; it was almost like a nuclear blast. "This was like a major, breakthrough turning-point, because these people were receiving now the Grace of True Contrition, True Remorse. So much so that even the angels, and certainly the demons, backed WAY back and just stood there in awe of what was happening! "There is now a major, HUGE hole in the darkness that was blocking the way between Heaven and Earth. It is allowing the Light of Jesus and Mercy to come through. It needs our prayers, sufferings and offerings to KEEP that hole open and wide." Ezekiel told me later, that all the night before he had tried and tried to play a Mercy Chaplet, or a rosary on his computer. But the only song he could get to 'work' was a song by Freddie Haler called "Songs of the Angels". A song about how the angels rejoice at the repentance of a single sinner. These people, wicked as their deeds had been, were a beautiful part of the Great Harvest the Lord speaks of. Now they would be with Him - eternally. Oh, all praise to the Lord, Heartdwellers! All praise to the Father! All praise to Holy Spirit! Next, Ezekiel was shown that even for many of the guilty souls listed in these indictments, who were not yet IN prison... they, too, were receiving this same breakthrough, and they were starting to understand. To repent. The Grace of True Repentance was reaching them, too. Jesus was visiting them personally, because we have been asking Him to do just that! To tear through the Darkness. To visit these soon-to-die ones and reveal Himself to them one last time. To give them yet one more chance to see and find Him - and receive Him in Truth. This Light is such a contrast to these souls, to the Darkness that they had been living in! Such a contrast to the lies and deception they had lived under--some of them, most of their lives. By now (it was around 11:00 or so) and this particular Battle was nearing its end. Ezekiel's pain was growing far less. And he remembered that all the Scripture readings he had received through the night before had been about the Harvest & Fruitfulness. As we talked together, we realized something I'd never thought of before. Not ONLY is the Lord draining the Swamp - He is turning the filth of the Swamp into Glorious Victory for the Kingdom of God. Yes, these people were dying - the ultimate punishment for their crimes that man metes out. But Jesus was, at the same time, snatching them out of the hands of the one they had been serving all that time - and bringing them Home, even at that last moment, to Glory. After we hung up, I went back to what I had been doing before the call: journaling. The glow of Joy I was feeling at all the Lord had done was just washing over me, and I reached for my phone to turn back on my worship music. And the first song that came up? The "Easter Song". Are many of you guys old enough to remember that song? Keith Green wrote it, probably back in the late 60's. It starts out: "Hear the bells ringing, they're singing you can be born again." Later in the song the words are: "The angels, they all surround us, and they are ministering Jesus' power. Quickly now, reach out and receive it, for this could be your glorious hour." If that weren't confirmation enough, as I was listening, I pulled the rhema: "If you will not suffer, you will not be crowned. But if you desire to be crowned, fight manfully and endure patiently." Two more confirmations: The next song that came on was about Mary, who we all know has a GREAT hand in all of these things! And then to finish up, Michael Card's song "The Basin and the Towel". I'll quote some of those words, too. We still have one more week to go, to fulfill His call to us for deep, entrenched prayer & suffering for this nation, our President, and the world. Together, Heartdwellers, let us "suffer and fight manfully, enduring patiently". And let us also "take up the basin and the towel" and press in for the sake of the souls He is so dearly longing to bring Home--no matter WHO they are, or what they have done in their lives. Because, always He would remind us: If not for His Grace - we, too, could be on a prison ship awaiting execution.